Washington Irving in his chronicle of THE HUNT PARTY of the ASTOR EXPEDITION in 1811, referring to this section of IDAHO said: "It is a land where no man permanently resides; a vast uninhabited solitude of a world; vast desert tracts that must ever defy cultivation and interpose the dreary and thirsty wilds between the habitation of man"
Little did he realize the day was not far distant when courageous men and women would prove that they had the will to conquer the unconquerable. It was on the Snake River that our Idaho Pioneers brought to full fruition the dream of a reclaimed desert out of the arid West. 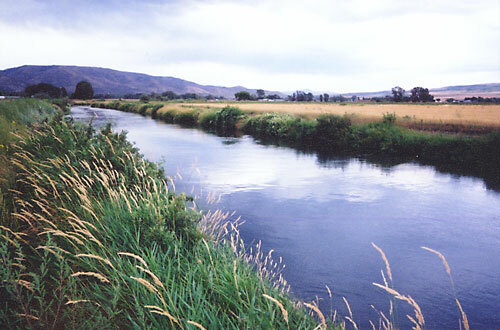 Snake River Water was Southern Idaho's greatest resource and the key to it's development. One of the first and most essential tasks homesteaders in Southeastern Idaho faced was getting water from the mighty Snake River onto their land using only hand tools and horse drawn equipment. Canals were the means homesteaders used to get water from the Snake River onto their land. These canals, built with horses and hand operated scrapers in the late 1800's and early 1900's, are still in use today. My crop was all up, and real farming commenced. To get my ditches all dug, I had worked day and night." 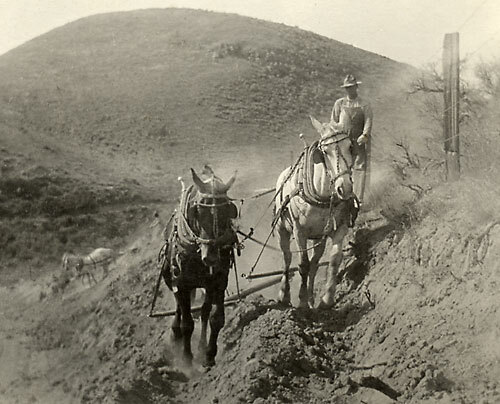 In the picture above a Morgan family member, Robert Morgan, son of Edward and Sarah West Morgan and grandson of Thomas Morgan, is using horses and a buck scraper to plow a new irrigation ditch into a hillside. Robert is driving the horses and a second man, not visible behind the horses, is handling either a hand plow or a Buck Scraper. Behind them a third man is hoisting the handles of his Buck Scraper to dump the soil from it. Although most of the heavy work was done by horses and scrapers, men with hand shovels did all the finish work. 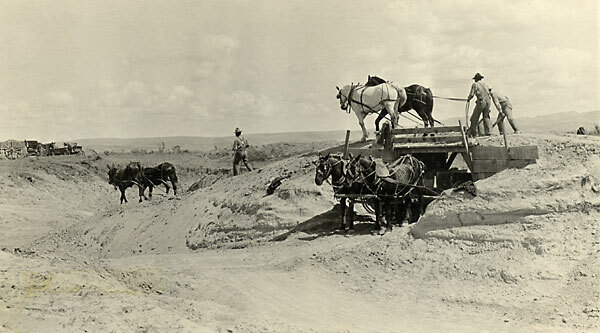 In the picture above men are using horses and Buck Scrapers to drag loads of soil up onto a ramp and dump them into wagons so the soil can be transported to areas where it is needed. More than one hundred years later the canals that carry water from the Snake River down to farms in Southeastern Idaho farms are an important part of the infrastructure of a strong and healthy farm economy. It is an unfortunate characteristic of our fast-paced modern society that we seldom or never pause to reflect on or appreciate how much our current prosperity was made possible by the people who came before us. Their labors and sacrifices, which profited them little, contributed enormously to the wealth, prosperity, and freedom from drudgery that we enjoy in America today. 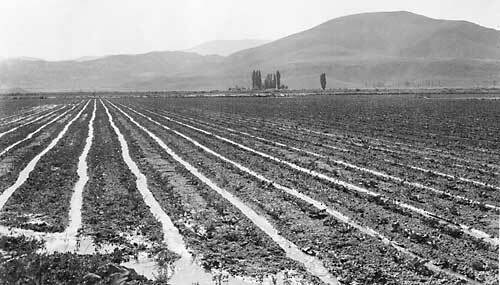 It was irrigation that tamed the west. In 1884, when the pioneers in the Southeastern Idaho area were discouraged one of the Mormon leaders, Wilford Woodruff (then president of the Quorum of the Twelve in the LDS Church) came and gave what is now called "The Wagon Box Prophecy." He stood in a wagon box and predicted that this part of Idaho would "Bloom Like A Rose." But first the mighty Snake River had to be tapped for water, canals built to bring the water to the farms, and ditches built to deliver the water to the fields. When water was finally applied, after much labor and heartache, to the farmlands in Southeastern Idaho the area did indeed bloom like a rose. TODAY THE TURBULENT SNAKE RIVER TRANSFORMS OVER THREE HUNDRED MILES OF DESERT LAND INTO GREEN FIELDS IN WHAT WE LOVE AND AFFECTIONATELY CALL "OUR UPPER SNAKE RIVER VALLEY." OUT OF THE TOIL AND SPIRIT OF OUR IDAHO PIONEERS, THROUGH A HISTORY OF HARDSHIPS WELL REMEMBERED, THE ENERGY AND RESOURCE OF OUR PEOPLE HAS MADE A DESERT BLOSSOM BY BENDING THE SHINING STRETCHES OF SNAKE RIVER TO THE USERS OF A FLOURISHING AGRICULTURAL ECONOMY. To make of desert fruitful farms.